Soviet cosmonaut Valery Bykovsky, seen here wearing his Vostok 5 spacesuit, died on March 27, 2019 at the age of 84. Valery Bykovsky (at left) with fellow Vostok cosmonauts Valentina Tereshkova, the first woman to fly in space, and Yuri Gagarin, the first human in space. Valery Bykovsky (back row, second from right) with his fellow cosmonauts in 1964. Back row, from left to right: Gherman Titov, Yuri Gagarin, Bykovsky, Andrian Nikolayev; front row: Pavel Popovich, Boris Yegorov, Valentina Tereshkova, Vladimir Komarov and Konstantin Feoktistov. Valery Bykovsky (left) with his Soyuz 31 crewmate Sigmund Jähn, the first German in space. 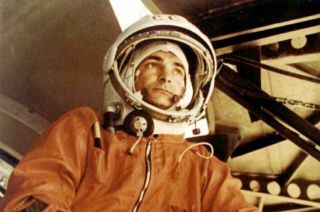 Bykovsky was preceded in death by the pilots of the first four Vostok missions (Gagarin in 1968, Gherman Titov in 2000), Andriyan Nikolayev in 2004 and Pavel Popovich in 2009), who died in the same order they flew. Of the original group of 20 cosmonauts, only Alexei Leonov and Boris Volynov are still living.